About 25 years ago, about eighteen months into my first job, I was working on the design of a brochure with my boss, Massimo Vignelli. It was some kind of corporate brochure. I don't remember what company. In fact, I mainly remember one thing about it: it was to include a black and white photograph of the company's chief executive on one of the first few pages. The client had approved the design, and I was sitting with Massimo, attentively taking notes as he talked about how we would go about getting it done. On this page, he said, we'd have a series of line drawings of the company's product. Line drawings, I wrote in my notebook. This divider page should be a bright color, like PMS Warm Red. PMS Warm Red, I wrote. And for the portrait? Oh, that should be something special, said Massimo. We should get someone really good to do it. Someone like Arnold Newman. Arnold Newman, I wrote. I went back to my desk, got out a Manhattan telephone book, and looked up Arnold Newman. Oddly, I found the right number right away. I dialed it. A man's voice answered the phone. "Hello, I'd like to speak to Arnold Newman," I said. "Yes," came back the voice. I wasn't expecting to get him on the phone this quickly, so I switched to a new manner that I had been trying out recently: brisk, businesslike. "Ah, Mr. Newman. 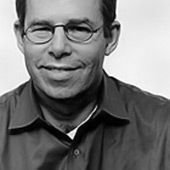 My name is Michael Bierut and I'm a designer" — actually more like a production artist, but no need to get into details — "at Vignelli Associates. We're looking for a photographer to work on a new brochure we've designed, and we thought you could be someone we might consider." I loved this kind of thing: we're considering people. "May I ask you a few questions?" "First, do you do portraits?" There was a long pause. Finally: "Er...yes, I do portraits." "Great!" Mr. Newman was sounding a little unsure of himself, so I tried to sound peppy and encouraging. "Okay, can I ask if you do black and white portraits?" An even longer pause. "Yes, black and white. Color, and black and white. But mostly black and white." "Well, that sounds perfect! Would you mind sending us over your portfolio so we could take a look?" Today I cringe as I write this, wondering what could have been going through Arnold Newman's mind as he submitted himself to some little twerp's inane interrogation. But the voice, though hesitant, was formal, polite, almost pleasant. Arnold Newman agreed to send me his portfolio. I like to think that he put it together himself, with extra care, just to teach a young punk a lesson. And by the end of the day, it was delivered to our office with my name on it. I opened it up, and there they were, all original black and white prints: Igor Stravinsky. Pablo Picasso. Max Ernst. Marilyn Monroe. Eugene O'Neill. Martha Graham. Andy Warhol. It must have been with special relish that he selected the photograph on the very top: his famous picture of John F. Kennedy in front of the White House. We didn't hire Arnold Newman for the job; he was, of course, too expensive. I never spoke to him again. But in that one short — and needlessly polite — conversation, he taught me a lesson about humility, patience and elegance that I've never forgotten. He died last week at the age of 88. A perfect example of why you should treat everyone with absolute respect and professionalism. You never know who you are talking to. Great post. Wonderfully put. Thank you for teaching me that lesson. Your article actually made me cringe in that I remembered a time before googling and wikipedia became the de facto research tool of just about every person who graduated from college in the last 10 years. Without my google, I'm sure I would have learned that lesson for myself much earlier. It is sad that formal research has taken a nose-dive as of late, but the ability to lookup anyone or anything reduces the chances of ever being unfamiliar with an unknown person, place, or thing again. Of course the quality of such information is put into question, but that a whole other matter. Great post. I am certain this is a story in which everyone can identify. You simply must treat everyone with respect if you hope to ever gain respect yourself. My father works in hospital construction and consulting, but long ago he was a civil engineer. His company won a bid to renovate a prison in Atlanta, and my father spent several long nights poring over blueprints in the company trailer. One evening, there was a knock on the door, from a well-dressed (if nondescript) gentleman. He introduced himself as the losing engineer, and asked if my father would show him the winning bid. My father invited him in, gave him a cup of coffee, and spent hours going over blueprints with his newfound audience. Fifteen or sixteen years later, my father interviewed for a position at a major hospital management company. The man performing the interview? That same architect, who had never forgotten the engineer who'd spent a late Tuesday evening showing him his bid. also this story also indirectly advises that people do remember if you were a prick to them as well. a "famous" designer who i spoke with on the phone over a decade ago (referred to me by several of his close friends) had no time to speak with me in person because he was so busy. that is understandable but to close off the blunt conversation and without even meeting me or knowing of my work, he advised me against even being in design. i have been following his career since then, and i suspect he has plenty of time now since he hasn't done jackshit. MichaelMy semi-similar blind telephone encounter wasn't with someone of as serious a reputation of Arnold Newman's. Many years ago I was looking for a cartoonist for a series of ads for a client. We didn't have Massimo's focus and clarity: "Cartoonist" was about as far as we'd thought things out. So I just called everyone in the Los Angeles Workbook listed as a cartoonist and didn't really quite notice the names. When Don Martin heard my request for samples to be sent over he asked "Did you ever read Mad magazine?" He seemed amused by my "Oh. You're that Don Martin?" but he pretty much knew that any male in my age range already knew his work. Allner wasn't around to check the artwork (it was a pretty simple job after all - just some lines with a couple of PMS colours in between). Easy. I did it quickly and sent it to the printer, there was no time nor need for a proof I thought. It was just a W and A combo thing... I'll get it done quick and show all how efficient I am. The poster was printed and inspected by Mr Allner. "What's this, there are 2 lines here?" he said. "Er, um, there are 2 lines on the slide, aren't there?" I replied. I had checked the slide by eye and under a lupe but not in a slide projector. It was a glass mounted slide and one of the lines did an 'optical thing' with the glass mount making it look like there were 2 lines there, not one. Oops. It didn't matter that my artwork was super-neat. I had added another line to Walter Allner's personal monogram that was probably designed as he was studying under Kandinsky and Klee. Major faux-pas. Measure twice. Cut once. Double-check, triple check. Lesson learnt. He gave me 'a polite look' and shrugged it off with a bit of a smile... but I too felt like a twerp. I was way too impatient and eager to show off. Great story. These are the kinds of things I love reading on Design Observer. I try and always keep ideals like that in mind. That totally reminds me of an experience I had in college. Wolfgang Wiengart is a personal friend and old professor of the head of our design program where I went to school. He came in for a week during my senior year and lectured, met with our senior studio class, and even came to a few design-sponsored parties with us. After the week was over, he had to be driven back to the Columbus (Ohio) airport three hours north. Being that I was the student in charge of all visiting lecturers, I was to be the one to drive Mr. Weingart that morning. At first we discussed his visit, then design, then a variety of other topics that someone might even talk with one of their friends about. What I had thought might be a quiet trip for just the two of us ended up being a really interesting and fun morning (at least for me). Definitely a great learning experience; much like that of Michael's written about above. A similar experience: About two years out of school, I was doing production work on stock photo catalogs; at that point I had virtually no design experience, so one design firm/designer was the same as another. One fine morning, word came that we were changing catalog designers, and that the "new guy" would come in for a few weeks, work out and finalize the book layout, and I would prepare mechanicals and get it on press. This was many years ago, and now I don't really recall actually being introduced to him, but kept hearing Mervyn enough to realize that was his name. Once he got in the office and started working, he had a lot of layouts to look over and the divider spreads caught my attention, as they used the section title, but dropped letters, or were inverted or reversed. Obviously, to my ignorant eyes, this was a tremendous error, and proceeded to "fix" them. When he saw this, of course, he was dismayed, perhaps horrified. It was then clearly explained to me, by our VP at the time (who hired Mervyn) that production artists did not do this, and that it should not happen again. Lesson learned. Naiveté is funny. I met Mr. Newman about 10 years ago. I knew his work, but I hadn't ever met any famous professionals, masters, people whom I respected. He was in St. Louis for a lecture and was very kind and accommodating. It's funny how when one's reputation precedes them the actual meeting is somewhat surreal and unexpectedly quiet. The work is larger than the man, if that's possible. Blogs are funny. I came here, as I often do, and found something that has taken me back to time before blogs existed and stirred my respect for someone whom I hadn't thought of in years. Isn't the Internet great? Thanks Michael. Reminds me of my first job after college when my boss was running a big time charity. A man on the phone announced himself as Jimmy Carter and was calling to get involved in the charity. It never crossed my mind it would be that Jimmy Carter, so thinking it was just some guy named Jimmy, I answered, "Well Mr. Carter, how were you thinking getting involved." "I thought I might speak," he said, "and help raise money." "Are you an experienced speaker?" I asked. "I've spoken at many events," came the amused answer. "Do you mind if I ask your profession?" "I'm a peanut farmer, but I used to be the President of the United States of America." "Um.... President Carter? Um. Please hold while I get my boss." Fifteen years ago I was at a real crossroads in my life and decided to call a famous designer who I admired from afar for advice. I was extremely nervous about doing this, as I had never done anything like it before. But I was very confused about my future and figured, at the particular point I was at, I had nothing left to lose. I thought maybe, just maybe, he might take pity on a struggling young kid and share some of his wisdom. I cold-called the designer, told the receptionist what I was up to and she put me on hold. About two seconds later, the designer got on the phone, and spent about 30 minutes counseling me and answering my questions as best he could. Two weeks later, I got a phone call from a young woman. Apparently, the famous designer referred her to me; he thought we had a lot in common and we should meet. We did, became great friends and did several projects together. I never forgot what the designer did for me, and I will never, ever forget the designer. It was Bill Drentell. I attended a joke of a college (in Lubbock, TX) with a guy named Hump Dog. We drank Lone Star, chased skirt and played soccer for FC Interstate Batteries (not in that order) in 110 degree heat. Brent was a cocky, curly-haired frat boy type (as was I). No way he was going to become a photographer. No way, I thought. Not this guy. Not creative enough. His pictures weren't all bad though- good enough to land him a gig assisting for Fredrik Broden. Impressive. But, still, I couldn't picture him in the role. The relaxer role. Neither could anyone else. One of our friends an illustrator, who had found some level of local success went so far as to belittle Brent in front of his friends. "You've got to get in there and do it! Like I did! Just get out there and act huge"! But, Brent, to his credit, never believed so much in himself. Eventually, of course, preserverence paid off. Ladies and gentlman, Brent Humpheys is officially huge! Especially in Germany where he is now chasing lederhosen, drinking pilsner and shooting Ronaldo. And the name of that successful illustrator? Hey, never kick a man when he's down. these are all quite timely and poignant comments for recent design graduates. thank you. A few years back I was in this master's programme which was a partnership with a reigonal university and a super creative agency whos founder happened to live in that small town. course which is expected to make the next generation of folks who lead creative initiatives for global brands. The eu funding for it increased the pressure to perform. To what standards? No one really could say. Tough place to be of course. It was tough for us too though since they were nervous they'd be oking "bad" work. They'd make noncommital hums and haws all year punctuated with puzzling comments and non sensical criticisms. I wondered if talking skills were more valuable than design skills. At one point I was so confused about what the requirements were for the ma and had not recieved any satisfactory answers for months - I emailed another school. Long story short, the woman found the email, showed it to everyone when I wasn't there and said some unpleasant things. I was called into the dean's office and threatened with legal action for making the school look bad. I mustered all the charm and diplomacy I could and managed to soften their tone. When the teachers left, the dean asked me to stay, "write an apology because you've deeply hurt Mrs.. xxxx" .. And I did. It was guarded but sincere. Anyway, after graduation, the studio hired me! Later, the following year's students had to do introductory presentations for the design studio and we went into the school to meet and greet. I walked in flanked with everybody and sat down for the presentations. "You work for Attik now?" I've since gone on to do my own thing, but wow. I'll never forget that moment. Later on the studio actually parted ways with the university. I really feel the course could have become great, so it's sad. But like my grandmother says "you reap what you sow." Incidentally in the midst of that year, I met Michael in London at his Pentagram lecture and appreciated the time he spent chatting about design and some of his posts on this blog with me. Interesting snippets. Serve to prompt one to never fall asleep at the wheel, knowing full well that such a thing is inevitable and usually it is that one time when you do drop your guard that these types of interactions happen. The great ones know this and, hence, the bemused and indulgent responses. Thanks to all for revealing your red-faces and giving us an education at your expense. Similar story on my part with David Douglas Duncan, Marine Corps combat photographer. My bosses used his photo on the cover of a special edition magazine. Very nice guy. I was impressed. Said he studied Marine Biology and ended up a Marine (Corps) photographer in WWII (and later Korea and Vietnam ) in some tricky situations, and some momentous historical occasions. Called him in France to ask his permission to use his photo for a reprint and got talking. Very nice fellow. A true "jet-setter." A great photographer in my eyes. Nice related story by Khoi Vinh here. Was it easier calling people in the good old days? "There's a whole industry laboring to create 'social software,' and in many ways the Internet is generating more and stronger connections than ever before, but it doesn't necessarily make people more approachable." Great stories. I too find them refreshing and insightful. One day around 1977-78, in Puerto Rico (my homeland), I was playing outside with my brother and friends. Suddenly a motorcade with flashing lights and a few cars drove down our street. We followed the cars until they parked just a few houses down from ours. A crowd quickly gather to see what was happening. Soon my father showed up with my then 2 year old sister. A man stepped out of one of the cars surrounded by other man dressed alike. This man quickly moved aside what I thought were his friends (bodyguards) and started playing with us. He then preceded to pick my baby sister up. For a while this man granted every request, we made, to play silly games. "Do you know who that man was?" I replied "no." "That's the greatest fighter in the world. His name is Muhammad Ali." To me he was the greatest play mate an 8 year old could ever had. Now days I am not impressed when meeting "famous" people. Ali made it clear to me; stay true, be real. An insightful and enlightening post, and all of the comments read like the second and third chapters. This could easily be a short Emigre. What a beautiful piece. Thank you.